Creamy Garlic Parmesan Brussels Sprouts & Bacon will become your NEW favourite way to eat Brussels Spouts! Pan fried Brussels sprouts and bacon baked in a cheesy creamy garlic sauce, and topped with bubbling mozzarella and parmesan cheese! This recipe is guaranteed to convert ANY sprouts hating fan to fall in love with these little suckers! Me included! And bonus? It’s low carb! Okay, I have a confession (another one). I can’t stand Brussels sprouts. When I see a sprouts recipe, I run in the other direction. RUNNN. But these? These are SO GOOD! I’m now a convert and will be thing up new ways for these little oval green things. 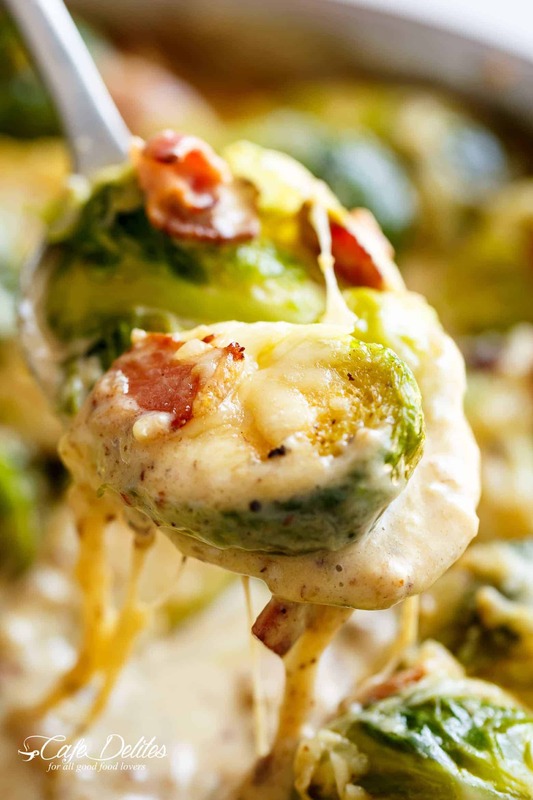 Creamy Garlic Parmesan Brussels Sprouts & Bacon has everything you love! To make the sauce even thicker, I’m giving you guys an option to thicken it with cornstarch slurry (cornstarch mixed with water before adding into the sauce). I make this with light cream, but you can use half and half (half milk and half heavy cream), OR heavy cream if you’re looking for something richer. You can also swap out mozzarella cheese for other cheese. Some options include Provolone, White Cheddar, Gruyere, or even Swiss. It’s no secret how much I, and YOU, love garlic parmesan creamy sauces. 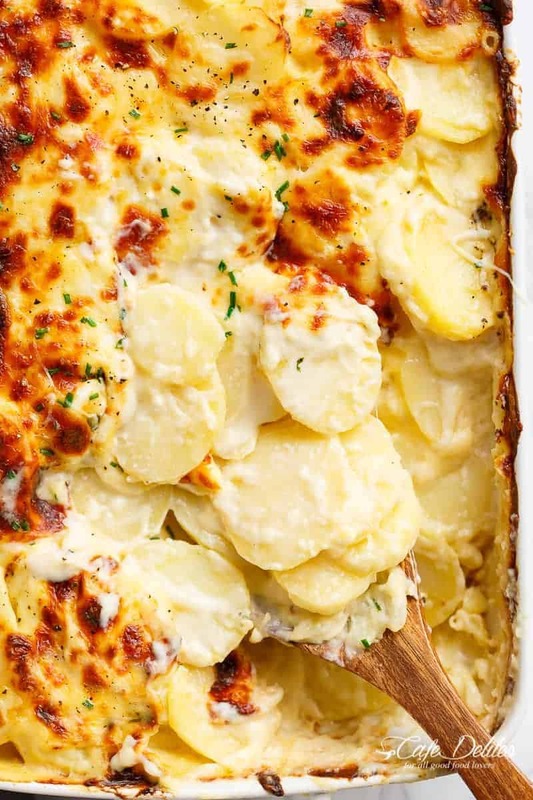 Some of your favourite recipes include this Creamy Garlic Parmesan Mac And Cheese, and how about these Garlic Parmesan Scalloped Potatoes. What about chicken? YES! I have one of those too! 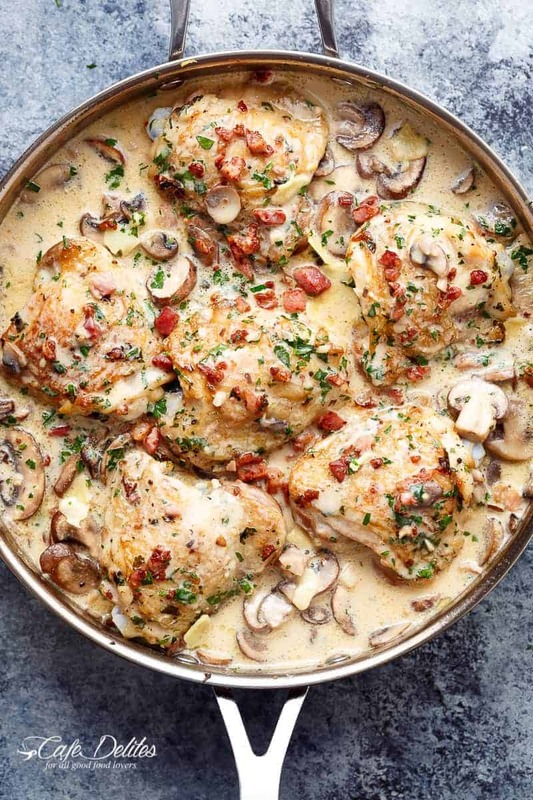 Creamy Garlic Parmesan Mushroom Chicken & Bacon, which is where the inspiration for this recipe came from. 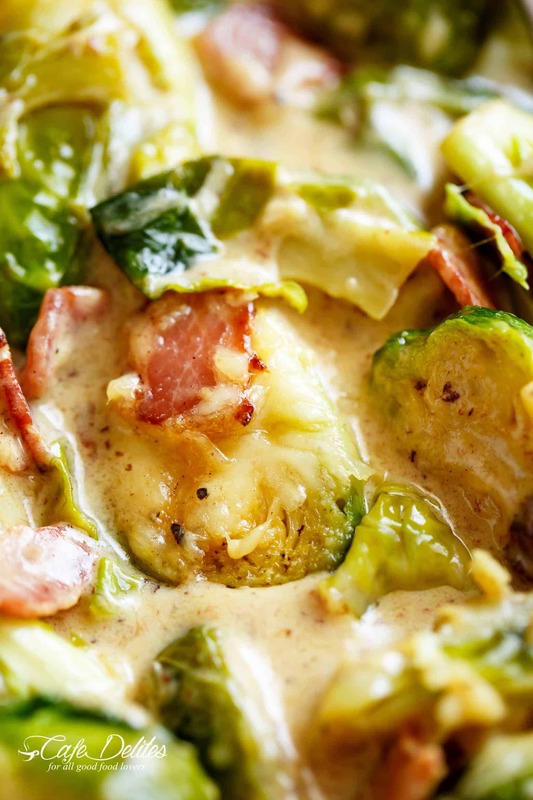 And NOW Brussels sprouts swimming in creamy sauce? Delicious. Sprouts swimming in a Creamy Garlic Parmesan Sauce? 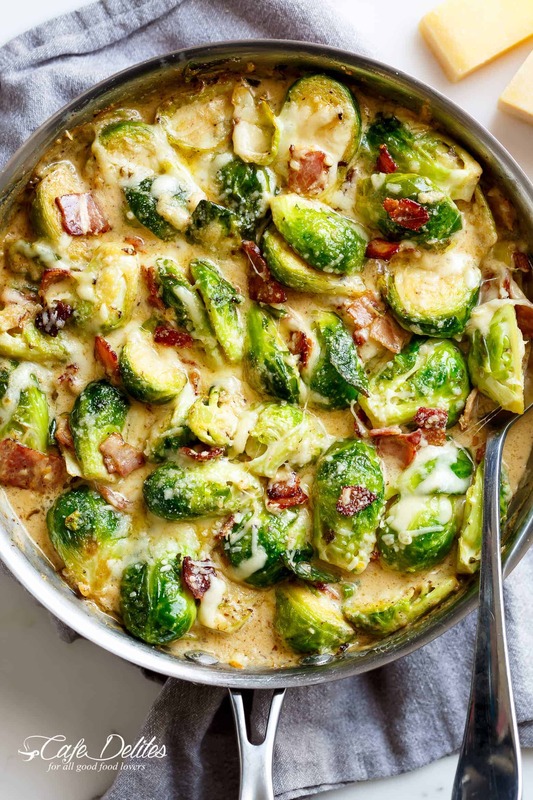 Creamy Garlic Parmesan Brussels Sprouts & Bacon will become your NEW favourite way to eat Brussels Spouts! 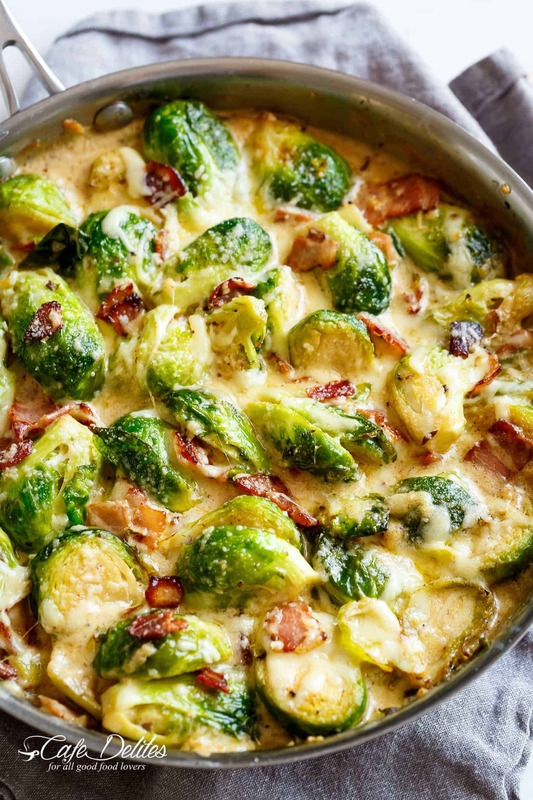 Pan fried Brussels sprouts and bacon baked in a cheesy creamy garlic sauce, and topped with bubbling mozzarella and parmesan cheese! This recipe is guaranteed to convert ANY sprouts hating fan to fall in love with these little suckers! Me included! Drain most of the bacon fat from the pan, leaving about 1-2 tablespoons for added flavour (adjust this amount to your liking). In the same pan, melt the butter, then add the Brussels sprouts and season with salt and pepper. Scrape up any browned bits from the bottom of the pan, and cook while stirring occasionally, for about 6 minutes. The edges should start crisping and slightly charring. Add the bacon in and give everything a good mix to combine all of the flavours together. Top the sprouts with the mozzarella and parmesan cheeses. Bake until cheese is bubbly and sprouts are done to your liking (about 15 minutes). If you like your cheese browned, change oven settings to broil for 2-3 minutes, until golden.